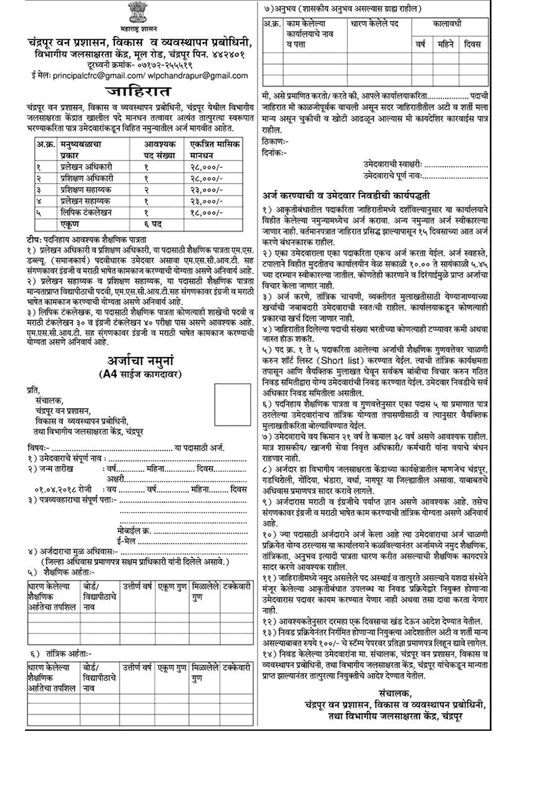 Chandrapur Forest Administration (Chandrapur Van Prashasan), Chandrapur Published Job Notification for 06 Documentation Officer – Training Officer & More Posts. Candidates who wish to apply must look at Chandrapur Forest Administration Documentation Officer – Training Officer & More Recruitment 2018. Eligible candidates can apply Offline before 15-07-2018. Education Qualification: MSW/ Graduate/Typing Exam Pass in English with 40 PM and in Marathi 30 WPM MSCIT and More. For Post wise Education Details follow the detailed advertisement. Interested & Eligible candidates can send their application along with all the necessary documents and testimonials to Director, Chandrapur Forest Administration, Development and Management Academy and Departmental Water Conservation Center, Chandrapur. Starting Date, Last Date to Apply Offline at Chandrapur Van Prashasan which candidates should be remembers as follows. Start Date to Apply Offline: 30-06-2018. Parbhani GK Current Affairs 2019 Parbhani History | Parbhani Geography | Parbhani Science | Parbhani Polity | Parbhani Economy | Parbhani Law etc.